So what exactly is radon and why should I test for it? We get this question a lot, and deservedly so. Up for a little radon 101? According to the Environmental Protection Agency radon is the second leading cause of lung cancer among Americans behind smoking. An estimated 20,000 people die from this each year. Radon is produced from what is called a "decay chain". Here it is in part....Radon 222 is a by product of radium 226. 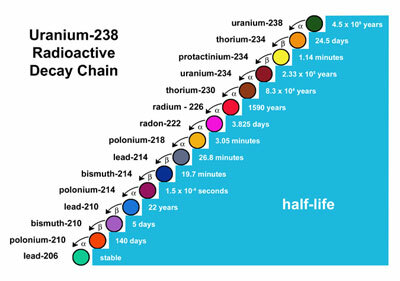 Radium 226 is a byproduct of Thorium 230, which is a byproduct of Uranium 234, which comes from Proactinium 234 and so on. Check out the chart below. Radon (Rn): A colorless, odorless, naturally occurring, radioactive, inert, gaseous element formed by radioactive decay of radium (Ra) atoms. The atomic number is 86. Although other isotopes of radon occur in nature, radon in indoor air is primarily Rn-222. Our radon units, 1028 Sun Nuclear models (below), conduct continuous measurements (CRM's or continuous radon monitors) each hour. The test has a minimum of 48 hours and you will be provided a one page report upon completion. In most cases, we are able to notify your agent of the immediate results when the unit is pulled. "These active continuous monitors (method CR or CW) have capability to integrate and record a new result hourly. Shorter integration periods and more frequent data logging afford greater ability to detect unusual variations in radon or radon decay product concentrations. The minimum measurement period is 48 hours. The first four hours of data from a continuous monitor may be discarded or incorporated into the result using system correction factors (EPA 520-402-R-92-004; EPA 1992c). There must be at least 44 contiguous hours of usable data to produce a valid average. (The "backing out" of data [i.e., removal of portions embedded in the two days] to account for weather or other phenomena will invalidate the measurement.) The periodic results should be averaged to produce a result that is reported to the client. EPA recommends that measurements made for a real estate transaction be performed in the lowest level of the home which is currently suitable for occupancy. This means the lowest level that is currently lived-in, or a lower level that is not currently used (such as a basement, which a buyer could use for living space without renovations). Measurements should be made in a room that is used regularly, such as a living room, playroom, den, or bedroom. This includes a basement that can be used as a recreation room, bedroom, or playroom. This provides the buyer with the option of using a lower level of the home as part of the living area, with the knowledge that it has been tested for radon. "- (EPA, Protocols for Radon and Radon Decay Product Measurement in Homes). So there you go. Based on what we know about radon and where we live (middle TN is a Zone 1 area - see pic below), it's not a bad idea to consider having a test done. As the old addage says, "the more info, the better". Give Southern Comfort Inspections, LLC a call to set up your test...thanks!